After working for so many months to restore this Vermont timberframe, I was looking for an excuse to invite friends to come on over to Sissy’s Kitchen and see the restored frame. 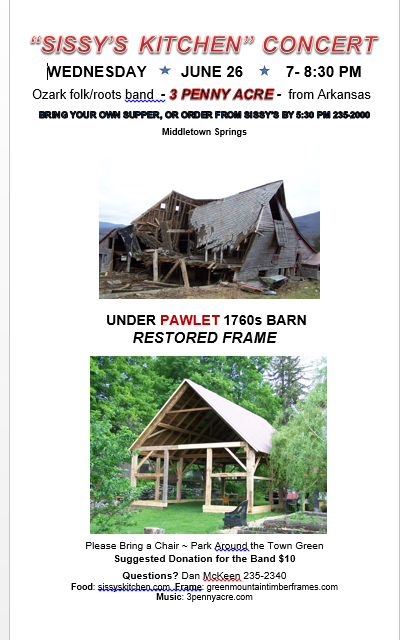 This gunstock barn was originally from Pawlet, Vermont, so I wanted some of the people from the town to come and see the restored frame. 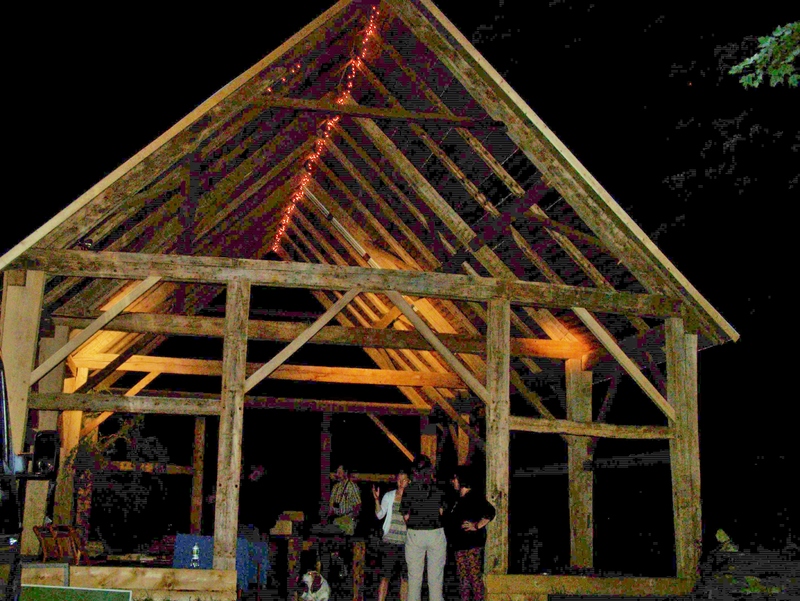 My second passion aside from timber framing is music, so when a former client of mine told me that 3 Penny Acre, a very fine band from Arkansas, was traveling through Vermont and staying at their own barn style home, I saw an immediate opportunity. The band was looking to add another gig to their tour, and I thought the frame would make an ideal spot for a night of mellow music, delectable food and starry skies. I checked in with Sissy about having a concert and she was game – offering to provide the crowds with tasty picnic style meals. 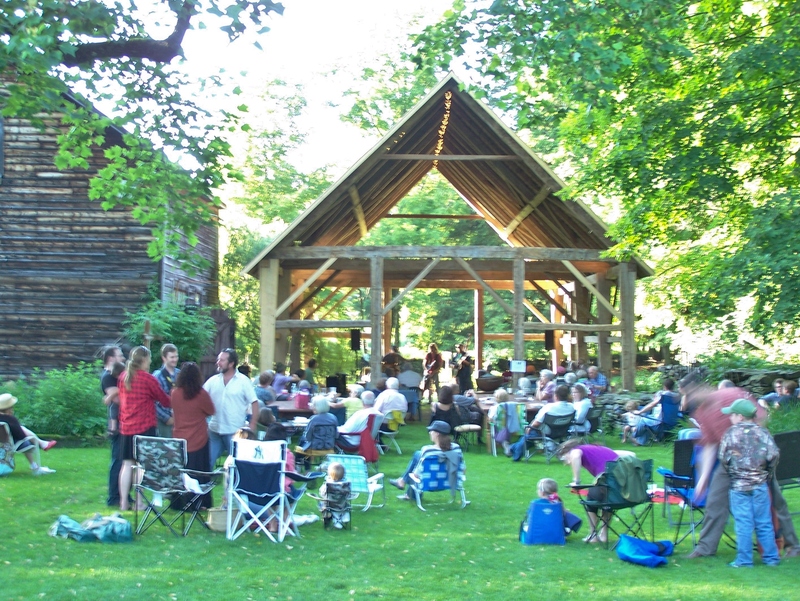 The Vermont summer cooperated with us and it was a beautiful evening. It was a grand event with over 100 folks showing from Middletown Springs and Pawlet, Vermont. The band played on into the evening and captured our hearts. It was such a success, that they will be coming back again this summer to record with local musician,Jim Gilmour. This entry was posted in Frames in stock, Green Mountain Timber Frames, Middletown Springs, Vermont, Timber Frame Projects and tagged available barn frames, barn restoration, bluegrass music, country music, Green Mountain Timber Frames, gunstock frame, historic properties, Post and Beam, Sissy's Kitchen, vermont timber frames, vermont timberframe by Green Mountain Timber Frames. Bookmark the permalink.